WordPress website for Elaine Kessler’s Photography, design for a clean super-powered website that would promote her creative photography business. Clean and minimalist was at the top of the list along with custom features that would highlight her services and more. 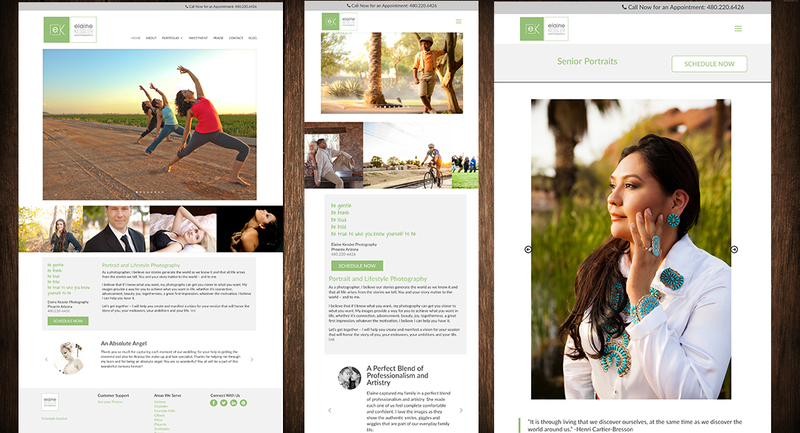 On of the most challenging is designing websites for photographers. The challenge is to showcase the photography without the website design getting in the way (the design has to be clean). The challenge is also to build the site so that it looks good on a phone and on a big screen desktop computer. Hours go into the planning, design and website development. Each page built from scratch, all photography sized to work on a vertical or horizontal and to enlarge on a mobile ‘pinch’. Custom designed, slideshows, custom blog, pricing page, extensive portfolio pages, all images optimized, and much more are part of the website.